~~ Luke 14:25-27 (ERV) ~~ Many people were traveling with Jesus. He said to them, “If you come to me but will not leave your family, you cannot be my follower. You must love me more than your father, mother, wife, children, brothers, and sisters—even more than your own life! Whoever will not carry the cross that is given to them when they follow me cannot be my follower. 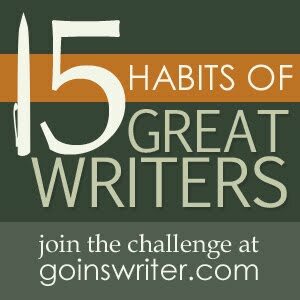 The third habit of great writers Jeff Goins says is to ‘Initiate’. A great writer will initiate that ‘big’ project they’ve always wanted to do; that thing that we’ve always delayed because of our fears. Great writers, and great people in general, push through the fears and come out on top with a finished project. Successful, bigger-than-life people, don’t just dream; they do. Well, technically I’ve already done that; started my big writing project that is. As a matter of fact, it half done. Though I started in a few years ago, I’ve been working on it, seriously, for seven months now. But, like most issues in my life, nothing is ever quite that cut and dried with me. Things are always big and dramatic; which is a Bipolar Disorder (BPD) symptom. I have initiated my project, but there is still more important initiation to be done before I can progress toward being a great writer. Like, yesterday’s assignment, as I did some reading, and some soul searching, God spoke to me about some important things. Part of these wonderful habits I’m learning, that I need, is that I write every day. Honestly, that’s one habit that I really have to work on a lot. If I really sat down to write every day, my book would probably be finished by now. I keep telling myself that I’m too busy to write every day, or I’m not disciplined enough, or I need some time management skills, or my health issues have take priority. Granted all these are true, but they are all great excuses to delay completion of this book. It seems that fear of success is not new and unique. I came to realize that one of my fears likely is of being successful. You see, I was also one of those kids that Jeff Goins talks about that wanted to be chosen to be part of the team. The difference is that I never yelled “Pick me.” I desperately wanted to be picked to play; but my biggest fear was also that I would be, so I would go to the back of the group in hopes that I would be overlooked and forgotten. If you’re a regular follower than you’ve already heard me mention that I have been extremely Social Phobic my whole life. I am changing, and how that’s been happening is a big part of my story that I’m writing in this book. God has done amazing transformation within me. But, again, I am not a finished work just yet. Changing my thinking patterns started out a few years ago with a conscious goal and effort, by positive affirmations written on index cards. This is a very complex issue, and positive affirmations alone probably won’t win the battle, but it will help a great deal. It’s been a great contributor to the progress I’ve made in changing my thinking patterns; and overcoming Social Anxiety (SAD) and Bipolar dragon I fight every day. Part of my assignment for today was to write down in a secret place “I am a ____”, and tuck it away for another day. Mr. Goins says “Yes, this is hokey, and yes, I want you to do it, anyway.” My first thought was “No, it’s not hokey. It is another positive affirmation to add to my stack of cards, bible verses, and the sticky notes on my mirrors.” I saw this as just another small confirmation from God, that this is the right direction for me to be following. Of course, I also think it could be God’s sense of humor happening here since “hokey” is how I’ve felt my whole life, about myself. Maybe that’s a sign that it is. Either way, it works for me. Another revelation in my prep work today was that some of my issues are, at least in part, enforced by other sources. I seriously wonder why my life didn’t seem to go the way that everyone else has. Part of it is the SAD and BPD, I know that. I also know that most BPD sufferers, though they go through much trauma wouldn’t push a button to be released from their Bipolarity in exchange for “normal” if they could. I feel the same way. As much as I have longed to fit it, I’m learning that this is different than being ‘normal’. I seriously thought for many years, that I was the only one who didn’t know what their dreams were. I was very embarrassed about it, would never mention it, and made big decisions based on it. I’ve learned, thanks again to Mr. Goins, that feeling different, and having difficulty combining creativity and productivity does not completely stem from mental health disorders or negative thinking. They are also issues with creative personalities; as are things like not wanting to submit to authority, super sensitivity, associating our identity with our work, having problems receiving constructive criticism, selling anything (including ourselves), and having a habit of beating ourselves up the most. So it seems that it’s just who I am. There’s no getting away from it. God reinforces everything worthwhile in our lives. Not only I am different because of these issues, but because I am a child of God that is called to be different (Luke14:25-27 (ERV)). Of course, now that I am coming to terms with my differentness; Jeff Goins says “There’s just one catch: Weird isn’t weird anymore!” It’s the norm these days. Huh! Well, it’s about time! God has taught me in recent years, that stepping out of my comfort zone is something He will absolutely insist on. However, He’s also shown me that despite the pain it can cause sometimes, that I like to challenge myself. This is new and exciting for me. Granted, it’s maybe thirty years late, but I’ve finally come to know in my heart what my dream is. That thing that I am meant to do with my life; I am a writer. It is me, and the confirmation everywhere. It’s OK to be different. It’s who I am. I have initiated my big project already. Pastor Henry, has told me a hundred times that “God does not waste anything.” In this case, it’s my BPD and its effect on my creativity. When I’m in a mania period, my creativity sours. This is one of the reasons why BPD suffers wouldn’t choose to be ‘normal’. There are some BPD sufferers that even have talents that they don’t have otherwise. It’s a wonderful feeling, and my writing really is so much better during those times. So, not only am I a writer who’s writing, I have the God-given creative talent that I need to complete it. However, there is still another initiation that needs to be done in order for me to go as far as He wants me to in this expedition toward the goal of becoming a great writer. The assignment for today is to “start something you’re scared of”. Yea, thanks for the tip Jeff, but it’s the ‘scared’ part that bothers me. In order for me to fulfill my calling, and complete one of my biggest dreams, I have to step out of my comfort zone and be social. I have to mingle with the world more. It is a common SAD trait that we tend to choose vocations that keep us in the ‘safe zone’ away from the world. I am fully aware that this is probably one of the reasons why I like being a writer. I can do it as much as I want, for as long as I want, and I don’t have to leave my apartment very often. That something, that I have to initiate in order for my dream, and His will, to be done is that I have to become a real functioning, participating human being. Shoot! There’s always a catch! Of course, God has a plan. This week there are two social functions that I have to participate in. Deep inside, I’d rather listen to fingernails on a chalk board than go to these shin-digs; but growing wouldn’t be productive in strengthening us if it wasn’t painful. Initiation, launched... and there is a blessing waiting for me on the other end. ~~ Dear God ~~ Thank You for making those of us who are creative the way we are. Hokey is a good thing. Without the hokey people, everyone would be the same. How boring would that be? Please help us step out of our comfort zones, embrace the hokey side; and let our creativity flow in such a way that Your glory will shine through in every creative work. Then, use our works to bless others in the world. In Jesus name, AMEN.